1st VIC - Bow: Karsten Forsterling, 2: Robert Douglas, 3: William Tait, 4: Cameron McKenzie-McHarg, 5: Matthew Long, 6: Warren Keeble, 7: Drew Ginn, Str: James Tomkins, Cox: Sam Pullen, Cch: Chris O'Brien. In a typically tough race for the King's Cup, the Victorian crew raced well and were pushed by the young WA crew. It was perhaps fortunate that both these crews were adjacent lanes. Duncan Free raced well as usual to take another President's Cup but Brendan Long, Craig Jones and Peter Hardcastle pushed Free the whole way in a great race. In a rare occurrence, the judges were unable to separate these crews and a dead heat resulted. This was a fitting result for two great crews. 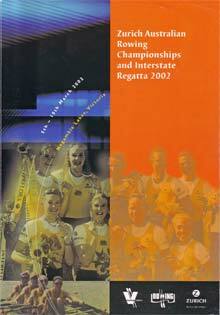 The Queensland crew had to win on lane 2 whilst a battle developed between Tasmania and Victoria on lanes 5 & 6. 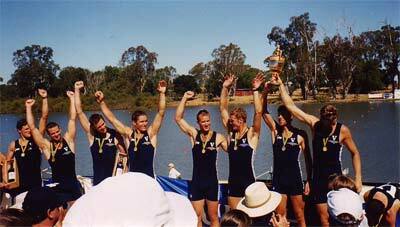 However the result was not in doubt with a fine win to the Queensland crew. This was a strong win to the favoured NSW crew. A superb race between Dana Faletic and Amber Bradley with only 0.02 seconds separating the two scullers.